Epson Canada says its new line of SMB-focused projectors and printers are geared towards helping small business owners rein in operational expenses. The company’s WorkForce Pro series of laser printers for instance are capable of cutting ink cost by up to 50 per cent compared to other colour lasers, says Epson. Epson Ultra-Bright line of projectors on the other hand, has a feature that automatically turns off sound and images whenever the operator needs a quick pause during a presentation. This and an auto shut off switch that powers off the projector without a cool down period, conserves lamps light and energy, says Epson. The Epson WorkForce Pro WP 4540 and WP 4530 all-in-one printers are ideal for small offices and departmental workgroups that require fast and flexible printers. Both printers are capable of printing 16 pages per minute (ppm) with black ink and 11 ppm with coloured ink single-sided and 9.2 pp black and 7.1 ppm colour for two-sided printing. Epsons new extra large ink cartridges enable the printers to print up to 2,400 pages on black in and 1,200 pages on colour. The machines have a monthly duty cycle of up to 20,000 pages. The WP 4540 includes a 580 sheep feeder tray which is the highest paper capacity in its class. The printer also has a 5.8-inch touch panel and 3.5-inch LCD screen for quick a navigation of the machine’s functions. The WP 4530 has a 330-sheet capacity feed tray. 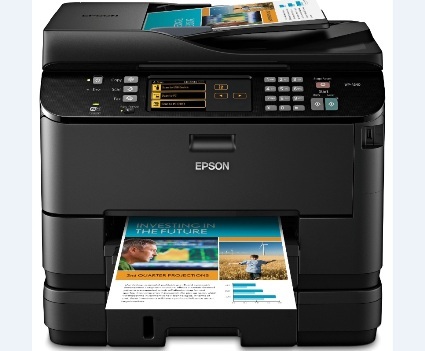 Epson also introduced the WorkForce Pro WP 4020 ink jet shares the same printing speeds with the laser printers. The WP 4020 has a feeder capable of holding 330 sheets. “All three models offer low running cost for high print volume needs but perform at twice the speed of other inkjet printers,” said Rodrigo Catalan, senior product manager of business ink jets for Epson North America. Epson also offers a much lower-priced printer ideal for family or small office use. The Sylus NX430 all-in-one comes with wireless technology and built-in remote printing capability. The printer is equipped with Epson Connect, a new portfolio of cloud and mobile service that enables users to print documents and photos directly to their Epson printers from a mobile device. 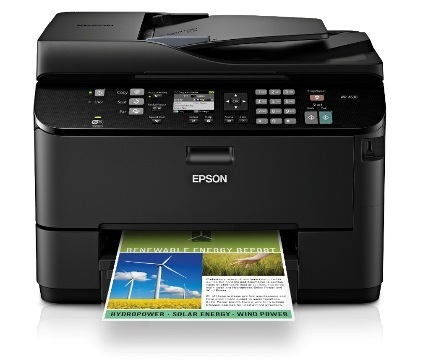 With Epson Connect’s Email Print feature, users can print out email and file attachments simply by sending an email from their smartphone or mobile device to an Epson Connect-enabled printer. The Epson Connect’s iPrint app for iOS devices and Android devices, enabled users to print content such as photos, documents and Web pages by simply downloading the iPrint app and connecting to a WiFi-enabled Epson printer. The Stylus NX430 is available for $99.99. Catalan said the WP 4540 retails for $399.99, the 4530 for $299.99 and the 4020 for $179.99. The newest addition to Epsons line of business projectors are the VS410 and VS350W. The VS410 ($899) has 4,000 lumens of colour and white light output with XGA resolution and the VS350W ($999) deliver 3,500 lumens of colour and white light output with WXGA (1280×800) resolution which is ideal for use with widescreen notebooks and high resolution content, according to Jason Meyer, product manager for Epson North America. “These easy-to-use projectors are the perfect options for businesses looking for a cost-effective projector with basic functionality and the versatility to perform in all lighting conditions,” he said. Power-saving features of the projectors include a feature that Epson calls Instant On/Off. The feature instantly turns the projector on or off without any cool down time. The A/V Mute Slide instantly turns off sound and video to create a quick pause during a presentation. This serves to conserve lamp life and energy. Both projectors come with built-in 5-watt speakers and Epsons E-TORL lamp technology which enables the lamp to last up to 4,000 hours in economy mode. The machines’ 3LCD, three-chip technology enables the projectors to deliver vibrant images superior to those provided by machines with one-chip DLP (digital light processing) technology. On average, Epson said, 3LCD requires 25 per cent less electricity per lumen of brightness.